Chángquán (simplified Chinese: 长拳; traditional Chinese: 長拳; pinyin: Chángqúan; literally "Long Fist") refers to a family of external (as opposed to internal) martial arts (kung fu) styles from northern China. The forms of the Long Fist style emphasize fully extended kicks and striking techniques, and by appearance would be considered a long-range fighting system. In some Long Fist styles the motto is that "the best defense is a strong offense," in which case the practitioner launches a preemptive attack so aggressive that the opponent doesn't have the opportunity to attack. Others emphasize defense over offense, noting that nearly all techniques in Long Fist forms are counters to attacks. Long Fist uses large, extended, circular movements to improve overall body mobility in the muscles, tendons, and joints. Advanced Long Fist techniques include qin na joint-locking techniques and shuai jiao throws and takedowns. Long Fist's arsenal of kicks covers everything from a basic front toe-kick to a jumping back-kick, from a low sweep to a tornado-kick. 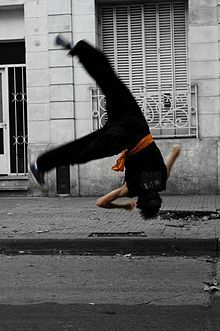 Specifically, typical moves in modern Changquan include: xuanfengjiao (旋风脚; "whirlwind kick"), xuanzi (旋子; "butterfly jump"), cekongfan (侧空翻; "side somersault"), and tengkongfeijiao (腾空飞脚; "flying jump kick"). The traditional long fist had a very small amount of techniques that were learned quickly; once you had mastered the three common Long Fist Stances of Horse, Dragon and Snake. With the Winding Roundhouse Punch, Meteor Fist Punch, Long Uppercutting Punch, Reverse Fist Punch and the Twin Gorilla Punch all the Hand techniques were covered. Adding the Winding or Whirling Roundhouse Kick the original style was complete. The only variation on this allowed Long Fist practitioners to also strike with their fore-arm and shins, not just feet and fists. Though still using the same techniques and movements. There are no blocks in Long Fist, although the execution of Long Fist techniques allowed the 'brushing' aside of attacks whilst delivery the powerful techniques. Practitioners of the Long Fist trained their style on live trees, hardening their limbs, improving their foundation and stances; and practicing to break bones. A Long Fist practitioner was deemed ready when the tree, given to the student by their master, failed to blossom in spring. Widely perceived to have a strong Shaolin influence, traditional Long Fist was widely promoted at the Nanjing Guoshu Institute by Han Qing-Tang, a famous Long Fist and qin na expert. After the defeat of Chiang Kai-Shek and subsequent closing of the institute, the new People's Republic of China created contemporary wushu, a popular artistic sport inspired largely by traditional Long Fist. However, this new evolution of changquan differed from the old style in that it was exhibition-focused. Higher, more elaborate jump kicks and lower stances were adopted, in order to create more aesthetically pleasing forms. Applications were then reserved for the sport of sanshou, which was kept somewhat separate from the taolu (forms).